My first effort on this zinc plate a few years ago was when I redesigned and old image on the plate surface. 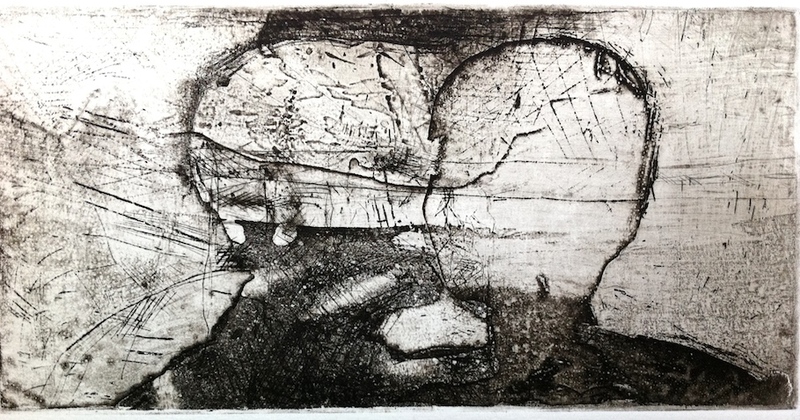 Originally a vertically formatted landscape that consisted of sugar lift intaglio and chine colle, I proceeded to turn it into a horizontally aligned format by removing part of aquatinted areas and keeping what I thought were areas of interest. I applied another sugar lift that introduced a second head. 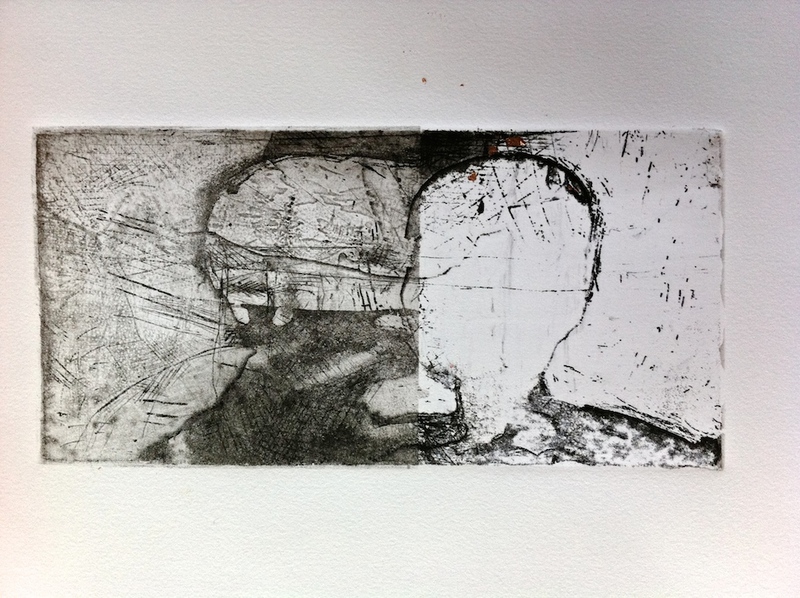 The first ‘head’ was accidental and placed together they looked as though they were engaged in conversation. Not quite happy I put the image aside. Then I thought the subject matter about a lost and ancient conversation made more sense. So in the thin rectangular area at the mouth level I thought Linear A etched in would be suitable as it seemed sympatico with the textured surface forms that also alluded to a ‘map’ of a lost landscape. Another image formed in my imagination that followed on from my heads and metamorphosis with landforms imagery: a rock face head as a momento mori? Then Lee Powell the tutor in our printmaking group suggested I apply metallic leaf instead of my usual chine colle treatment. A new experience for me so we gave it a go. The experiments were tricky as I think my usual rice paste and in this case brush (that should have been a softer acrylic or Japanese watercolour brush) were not suitable for enabling the leaf to adhere to the paper. Also a mis-register added to the experiment. 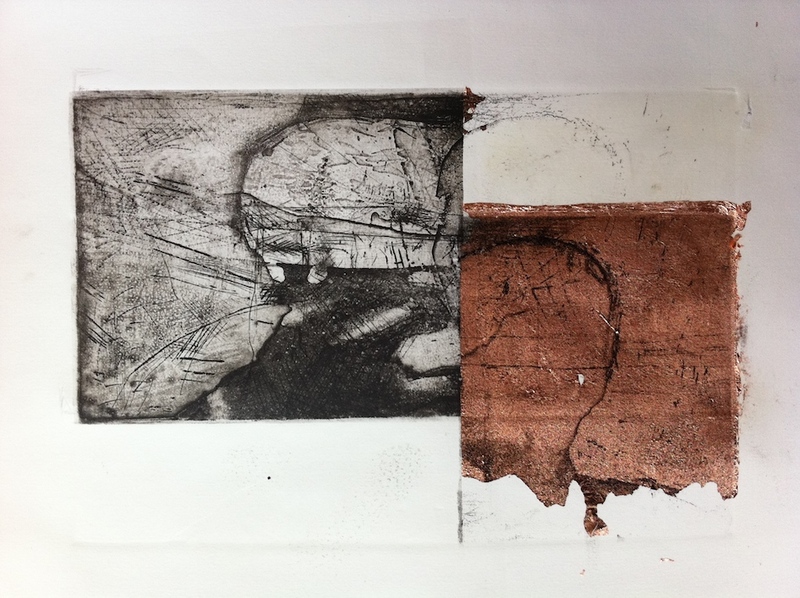 Anyway I produced several first proofs with many imperfections which can contribute to the final ‘look’ in the Wabi Sabi tradition of imperfection. That’s the theory: the practice can throw up all sorts of challenges that will present themselves in a few days when we have our final workshop for this year. I had intended to cut the metal leaf with a scalpel but was too clumsy so I thought let’s not get too fussy and let the textures in the leaf add to the etched look. Too much glue evident by the central blurry area also changed the printing. 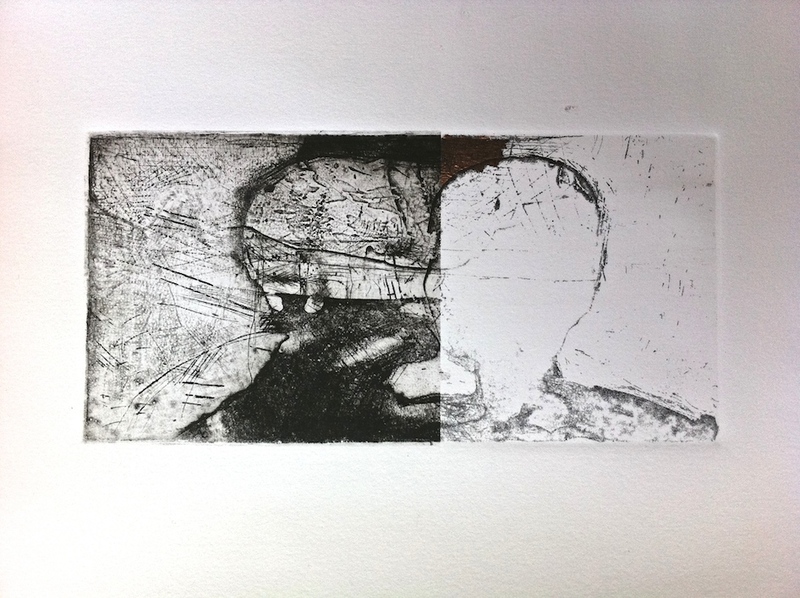 The plan now is to over print some of the copper metal leaf and obscure some of the blurred section. 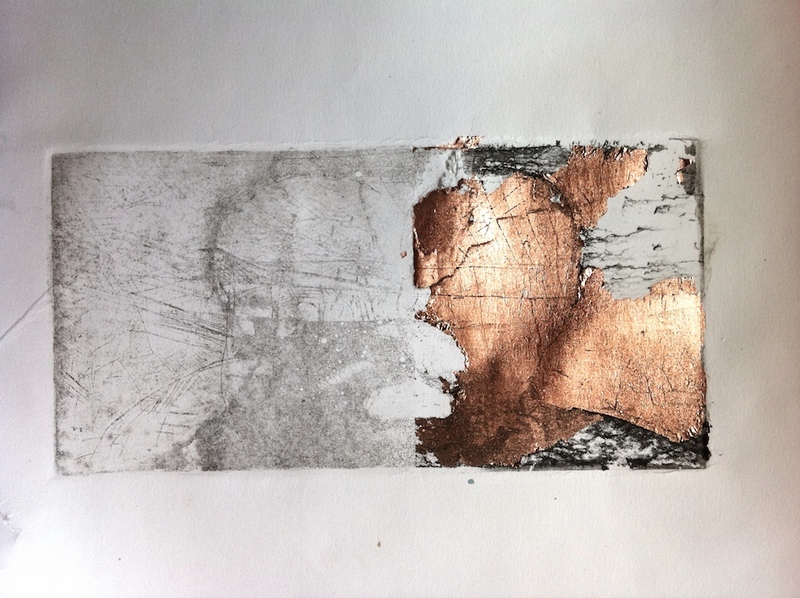 Another ‘ unexpected’ proof where only part of the copper leaf adhered to the paper leaving the other half of the plate un-inked making a ghost print. The plan is to partly ink up the plate on the second run through the press, hopefully integrating both sides of the composition. This badly registered effort could still produce an image with a ghost image at the back of the copper leaf, and by extending a few random pieces of the leaf into the other side the composition could coalesce; random pieces of alphabet maybe? In the following two images I thought the copper leaf may not require much glue but the leaf didn’t adhere and blocked out the half image leaving a ghost print. I thought I would experiment with gold and silver leaf as a way to rescue these two images. The plan is to under paint the ghost side with red and then apply gold leaf hopefully reducing its usually cold shiny surface. I will try to let the red show through the gold by making the fissures and cracks in its surface. What to put under the silver leaf to modify the shine? Ideally I would like to achieve a worn, distressed look. Anything could happen. 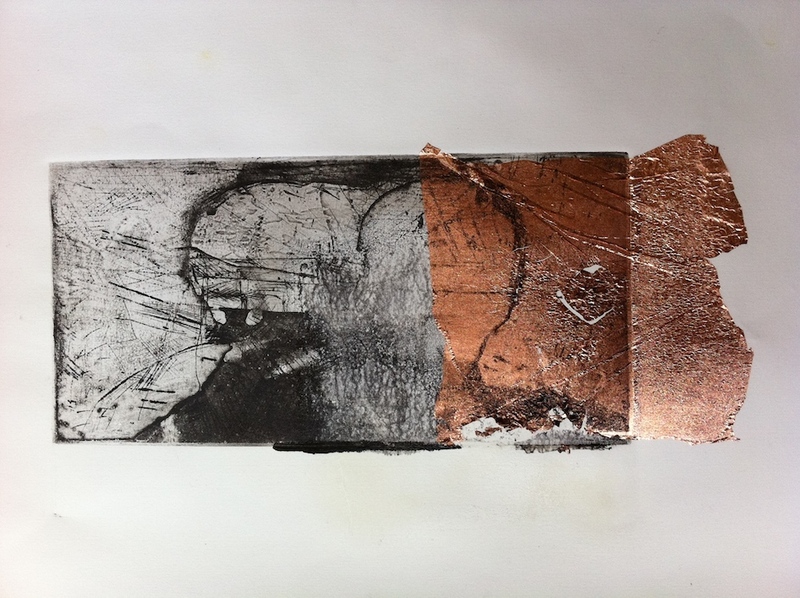 Categories: Etching, Mixed Media | Tags: copper leaf, Etching, zinc plate | Permalink.